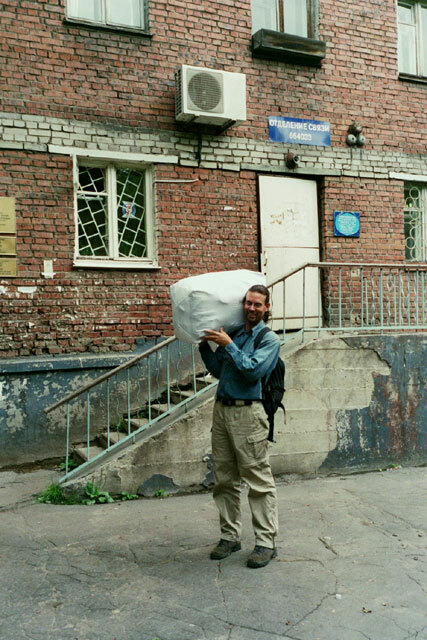 Start Irkutsk (home stay) N52º17.461' E104º16.812' 433 meters . - Post office . . . . Weather: Mostly cloudy and warm. Occasional sun in the evening. Today turned out quite different than planned, but this should possibly have been expected. We had a slow start and after a huge breakfast of blinis, we gathered up our stuff to go and mail off our bag of camping gear. We were able to borrow a small trolley, which made walking to the post office with the heavy bag much easier. We get to the small, district post office where we had been to yesterday before noon and find a corner to set up operations. We show the girl behind the counter (the one we had spoken to the day before) our bag and asked if we had to show her the contents (by the way, this is all taking place with sign language, as we have no common language). She indicates no, so Jacqui begins the long process of sewing up the sheets and sealing in the bag. At this time, Lars gives the girl a box of good chocolates (as she had indicated the day before she would greatly appreciate. We wanted her to be our friend). Just as Jacqui is about to finish sewing the last bit, the girl has a small break in the crowds and comes around to inspect the sewing job. She all of a sudden starts to talk loudly in Russian, indicating that this is no good. It is all wrong. She tries to explain it to us, but it is hopeless. She enlists the help of an old lady to also come and try to explain. We are still very confused. The girl then goes off into the back storeroom and comes back with another package. In the meantime, the old lady continues to try to demonstrate what the problem is. We soon realise what it is - the bag must be sewn from the inside, so that the stitching is not visible from the outside. It has to be such that someone cannot open the bag along the sewn section and then be able to re-sew it without any sign of having done so. This is a crushing blow. Jacqui has spent so much time sewing the bag up and all the work is useless. We see if we can turn the bag inside out, but we have too much loose, unused material to make this practical. What to do? We start to take out the stitches, but for us with our small needle, it will be very difficult to sew the bag up from the inside. We soon realise that the girl wants us to leave - it is her lunch hour and she will be closing up shop. We ask if she knows of a seamstress (again through sign language). After some thought, she indicates that she seems to know of one. She asks us to grab our stuff and head out with her. We walk to the nearby shopping center and there is a seamstress there - but it is closed. Nothing seems to be working out for us here. But the girl seems very determined to help us, so she goes in the back way and soon comes back to the front door with the seamstress. We explain the problem and she seems to understand what is needed. She says that she can get the bag sewn up within an hour, when we are to return and collect it. We spend the hour or so having lunch and dropping off the trolley back at the home stay. Then it is time to go and pick up our bag with its wrapping. We must say - they did a good job of sewing it all together. It fits in very snuggly and appears to have been sewn up according to Russian post office standards. Lars puts the bag over his shoulder and we make our way back to the post office. We arrive there and think that the worst is over - but the bureaucratic nightmare is just about to begin. After a short wait, we give her the parcel and the customs forms duly filled out. But, the problems begin. She tells us that the forms have to be filled out in Russian. We try telling her that Sergey translated the instructions for us on the back of the form, which says that it is to be filled out in the language of the destination country. Which actually makes sense, as otherwise how could customs in that country have any clue what is contained in the parcel. But she insists that she is right. At this point, some of the people in the line begin to get involved. They read the instructions on the back of the form and they agree with us and try to tell the girl that the form should be in English. She will have none of it and only after some further interjections from the others in line, does she call the main post office. The conclusion and what she insists on is that the address can be in English, but the rest must be in Russian. Still does not make sense, but we want to mail our form, so we have to comply. So what to do - no one in the line speaks English, so how to fill out the form. In the end, a kind young man offers to help and we need to go through a game of charades to explain what is in the bag, so he can fill it out on the form. We actually do quite well, and in the end he seems to understand that there is a tent, sleeping bags, hats, gloves, etc, in the bag. We then have to explain that they are used (we do not want to pay any customs duties on the stuff), and in the end by using the term second hand (we had seen shops with such signs), he seemed to understand. We hand the form in and - another problem. We have filled out parts that she is supposed to fill out (why she did not tell us this the first time, we do not understand). So, the kind young man helps us once again to fill out the forms - and this is all in duplicate. After waiting our turn in line, we hand the forms to her once more. But another problem. She does not like the use of the word "second-hand" - she says that we cannot mail anything that is used. We offer to cross out the offending word, but that is not allowed. We, or rather or young patient friend, have to fill out the forms again - once more in duplicate. We must say, during this whole time, all the people in the long line were very patient with us and the system. But they seemed to understand what we are dealing with - they have to put up with it every day of their lives. So, after around the fourth or fifth completion of the forms in duplicate (and there was another form that we had to fill out about three times, but that was easy compared with this one), the actual process of mailing the package begins. It is weighed, once again, and she fills in the details that she is supposed to. Then the bag has to be sealed. At the one end where the material has been sewn together from the outside, she puts huge wax seals. There is a big pot of melted wax which she pours on the sewn sections and then applies a large round seal. She must put on over 20 seals. Not sure how secure this is - if a postal worker wants to break in, he can just reapply the seal with the equipment in the post office. But we guess that it makes people feel better. Then we have to figure out how to ship it and make payment. At this point, a teenage girl has come into the post office. It turns out that she speaks excellent English. She has lived in the US for a couple of years while her father was teaching there. So she helps us out with this step, which is very complicated. It seems to take for ever and they are going back and forth in Russian. Even all the people in line do not seem to understand why it is so complicated. Also, she does not seem to want to insure it for just $100 - she says that it must be too low. We say it is fine, but this takes some back-and-forth to settle. After we pay, we think it is all final and we are ready to go. But just then she notices something about the addresses written on the package. They are al in English and the sender's address is also in Malaysia. She says that if it is English, the post office here will not be able to read it and know where to send it. We say that if it is in Russian, then the Malaysian post office will not know where to send it. In the end, we compromise but adding the word "Malaysia" written in Russian. So long as they can get it to Malaysia, the Malaysian postal system can do the rest. On the sender's address, she said that it had to be someone in Russia. We said that we do not have an address here. So, she grabs our pen and crosses out the word "Malaysia" and writes in "Russia" instead, leaving the rest the same. Not sure how this is better, but if it makes her happy and the parcel (and us) can go on our way, we are also happy. We finally finish shortly after 5 PM. What a day it has been (the postscript to this story is that our package finally arrived, in one piece, about 5 months later). It is just too bad that we have wasted the afternoon and cannot go see the museums that we wanted to go to today. But we still decide to head downtown to have a look around and relax after that ordeal. We grab one of the taxi-buses and pay our 7 roubles to get to the river front downtown. 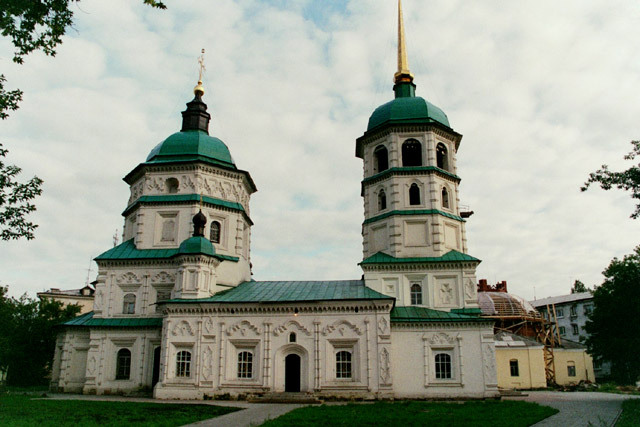 First we change some money and then walk along the waterfront along Gagarina street to check out some of the buildings. 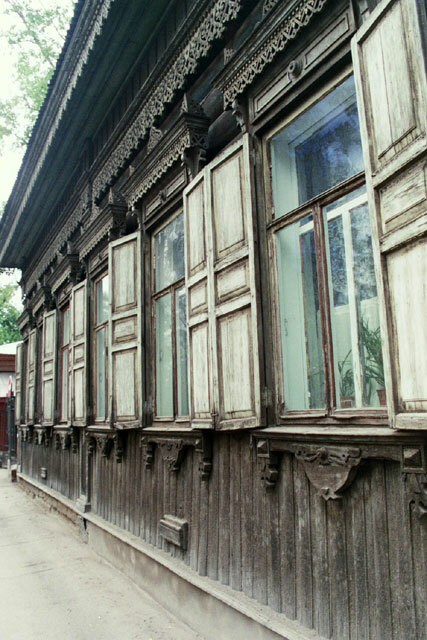 There is the local White House (former residence of the governor generals of Siberia), the regional museum and some wooden buildings. But these were not as nice as the ones we saw yesterday. It is then back to the promenade along the river where we stroll along in the sunshine. 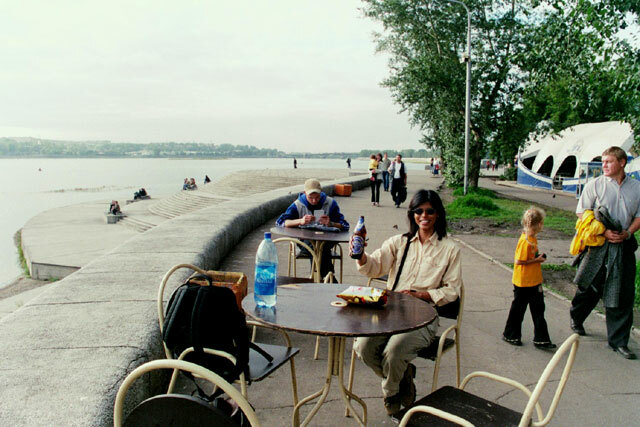 We decide to stop at one of the beer gardens and have a drink and snack, sitting down at one of the tables lined up along the promenade wall. Once we have rested long enough and some of the frustration from the day at the post office has worn off, we make our way up along the promenade, turning off to take a look at the Trinity Church. But it is closed for renovation, so we only get a look at the exterior. We are now very hungry, so we decide to go and have dinner at the same place as we went to yesterday. We had not seen any other good restaurants so far in this city, and this one was very good, so we decide to take advantage of it (we have such a hard time finding good restaurants in this country). 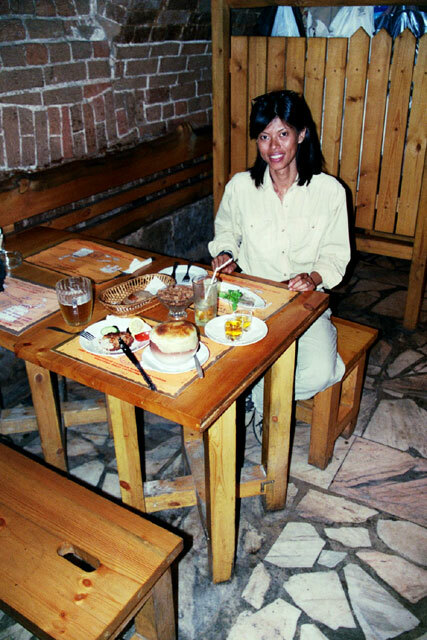 We make our way to Chkalova street and descend into the basement for a wonderful meal. We order a few dishes (get a few repeats, they were so good) and they are once again very generous with the free, home brewed spirits, so the last vestiges of the day's frustrations wash away. Once again, the food is excellent and cheap, the service friendly and efficient and the atmosphere warm and welcoming. It is now time to catch the taxi-bus back to the academic district and our home stay. We have gotten the system down pat and have no problems what so ever. We are back shortly before 10 PM and spend the rest of the evening packing and working on our journals.